Toxic Sugar??? All Sugar Not The Same! Much of the comments on the 60 Minutes program surrounded the work of Dr Kimber Stanhope, a molecular biologist at the University of California Davis. In March of 2009 she published a paper where she observed outcomes in two groups of overweight subjects who only differed in the amount of fructose or glucose that they drank. The glucose or fructose beverage made up 25% of their total calories, and total carbs were 55% of total calories. She found that the fructose group gained more fat around their stomach, experienced a worse lipid profile (risk factors for heart disease) and developed greater insulin insensitivity (risk factor for diabetes). Basically, this study suggests that not all sugar is the same. It turns out that fructose does not affect insulin levels (only insulin insensitivity), is metabolized principally by the liver, and is easily converted to fat. In fact, its the sugar that acts like a fat, and goes right to your stomach. This is not the fate of glucose, which is a sugar that acts like a sugar. This caused me to look further into the notion of sugar being toxic. 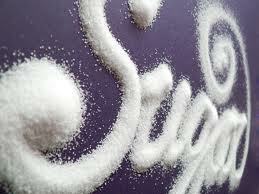 1) Sucrose, which is table sugar is a combination of fructose and glucose (the good linked to the bad). This is also the main form of sugar found in honey. While these sugars (sucrose) can be found in whole foods, the amounts are less, and the toxic effects of the fructose are lessened by the presense of fiber. 2) We get more sugar into our diet than we should and this is not good. For most, much of the sugar that we consume comes in the form of sweetened beverages, and most of that is fructose. As an example a large coke at McDonald’s has 84 grams of carbohydrate vs the Big Mac sandwich which has 45 grams of carbohydrate. And here is another important point, the carbs in the drink is all sugar, vs the sandwich where only 9 grams represent sugar. Pay attention to the amount of “sugar”, as this may be more important than the total carbs!?!? Also pay attention to the amount of fiber, more being better. 3) Fructose in excess has a greater negative consequence on our bodies because of where the fat shows up, and the effects on our lipid profiles, which changes them in a manner that increases our risk of heart disease. There is also suggestion that fructose is bad for our joints, causing pain and impairment in a fashion similar to gout (because it increases uric acid). 1) Limit your consumption of sugar containing beverages (pop, juice, etc). 2) Try to limit the amount of foods that are high in fructose. I did find one website that list foods by the amount of fructose that they contain. The website is called SelfNutritionData. It helps that you can filter the foods by category. Try to migrate your diet toward foods that are lower in fructose.